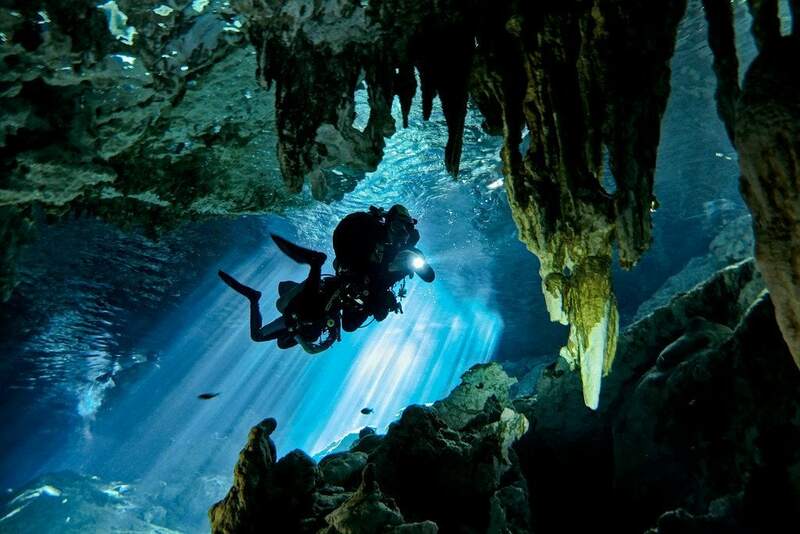 Unlike wandering around the famous Mayan ruins of Chichen Itza, cave diving in Mexico has risks. Swimming through dark underwater passages in the earth can be claustrophobic and confusing. With a roof of rock over your head, floating up to the surface in an emergency is not an option. You must go back out the way you came in. Cavern Diving is similar to cave diving, the difference is that some natural light is visible to you at all times. So cavern divers don’t go as deep into the passages as cave divers do. The cave opening doesn’t need to be visible, just some sort of natural light emanating from that opening. The penetration limit for cavern diving is 200 feet (60 m) from the cave opening. Cavern divers also use a guideline to prevent getting lost, but it’s already attached to the cave floor or wall. 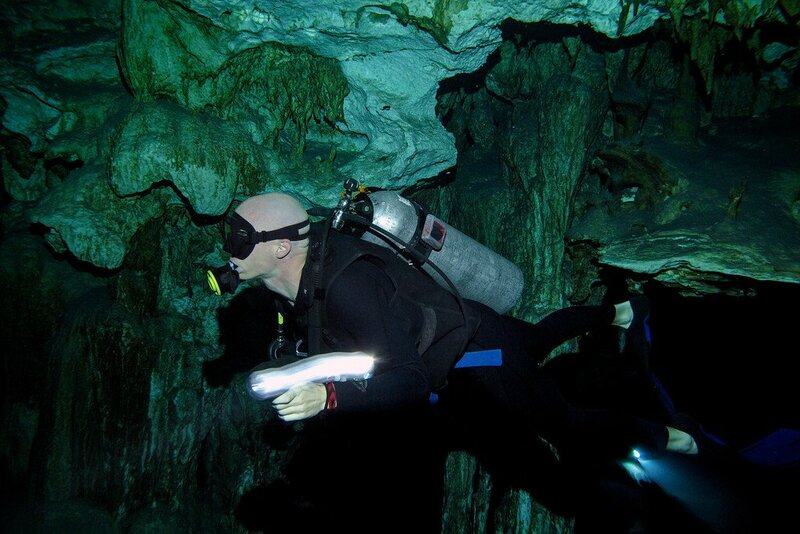 Both cave & cavern diving requires the use of underwater flashlights, as the environment can get quite dark inside a cave. Even if you can see some daylight off in the distance behind you, it may be pitch black in the direction you’re swimming! From the town of Playa del Carmen, it’s a cheap 40-minute colectivo ride to the Dos Ojos Cenote located between Akumal & Tulum. Our second dive lead into The Bat Cave. This route floats through tight passageways full of cathedral-like pillars of limestone. It’s almost pitch black swimming in this section and felt like a true cave diving experience. Have you ever heard of cenotes before? Would you swim in caves? Share your thoughts in the comments below! Great pictures. How did you made these clear pictures? I have always big problems to make nice pictures in the water. That’s why I never wrote about my diving. Whenever I think of Mexico this post comes to mind haha :). Was this filmed on your gopro? I agree with 100% cavern diving is a must if you’re visiting the Yucatan. 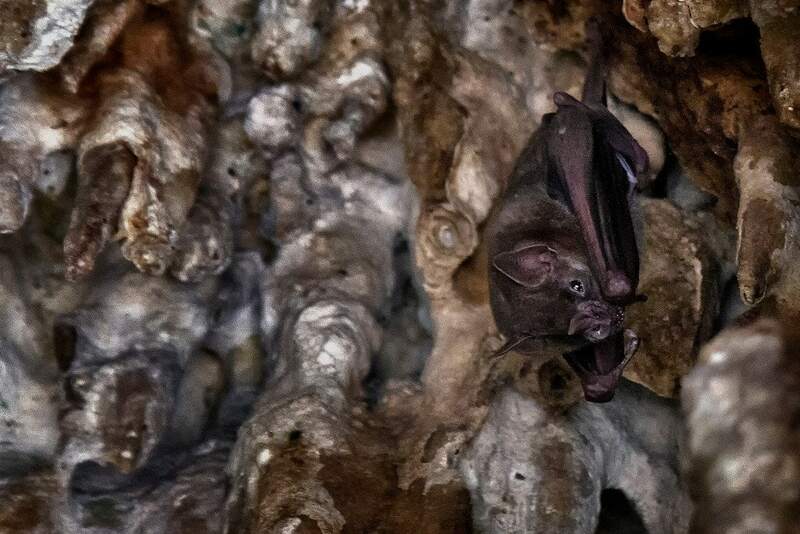 I have to say though when we hit the bat cave, There was only one or two bats on the ceiling. Perhaps time of day? Probably more time of the year. I was there a couple days ago and there were a dozen at most though my guide says in summer there are many hundreds in there. Thank you so much for all the information! It looks so interesting and I’m glad you enjoyed yourself. Next year I’ll be in Mexico and would love to go diving in Dos Ojos. Is there any general advice you could give me please on pricing, where exactly to get certified so I can dive, etc? Your help is greatly appreciated! Cheers! I am Soooo excited to have found your page!! I used to just LOVE adventures also! Luckily, I have your videos to watch so that I’m able to enjoy the adventure vicariously through you!! Thank you Soooo much for making these videos!! Glad you’re enjoying the videos Jackie! My mission this year is to do many more of them. I’ve got tons of footage, just haven’t put it together in to anything yet. Great video. I was lucky enough to dive both the pit and dos ojos this year and what a great experience it was! Both sites spectacular in their own way. The pit was probably the most intimidating and exciting dive I have ever done. The half way submersion into the bat cave at dos ojos was a very special moment! Keep up the good work. Yes! Fantastic Video Mathew! It is not that easy to get such good footage with all the minerals and movement in the water. Great Job! What type of camera did you use? I’m just writing about this now. Did this back in February and also went 38 metres into the Pit. My favourite was the Bat Cave but the Pit was intense. Something eery about being so deep and swimming through wavy sulphuric gas. Almost like a dream…. Cool Matthew! Diving in cenotes is quite an unusual experience for sure. It really feels like another world. I’d love to dive the Pit one day. I don’t know how your site and youtube channel isn’t more popular man your adventures are wicked, hope to follow your footsteps soon, thanks for helping me see my future. 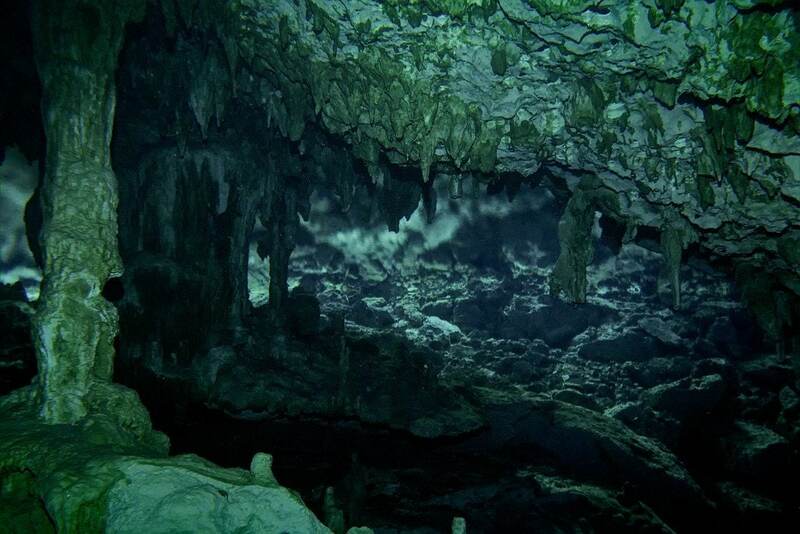 Unbelievable the visibility down in the cenotes. Definitely have to make it up from Costa Rica to do that one of these fine days. Do they require you to have any advanced training or minimum number of dives for diving these areas? What an amazing adventure that was! Loved the pic by Luis Leal – makes me want to dive right in. Thanks for sharing. Reallly Beautiful Matt! Love your posts! They always have great stories or amazing pictures! Cave/Cavern diving would be pretty scary! You are a brave brave man! Cool video! I have to share it. Snorkeling is about as far as I’ll go also, but Dos Ojos was still a great experience. My son loved watching the divers come out of the tunnels underneath us. As a scuba diver, this is definitely something high up on my to-do list! Love that first photo from inside the cenote with the light streaming in. So cool you got to do this! One of my favorite adventures in Mexico for sure. A whole different world under there. I wish I could claim ownership of that one Lawrence, but it was taken by Luis Leal, owner of the Dos Ojos dive shop. He’s a great underwater photographer! Wow, that third photo is amazing. Loved this post. I’d give my right arm to do this! I used to dive, but haven’t done any for years now. It got to be so expensive. Thanks for the vicarious adventure though! Anytime Linda. Diving can be expensive sometimes, but not too bad in Mexico. Only $10 to rent gear with these guys! 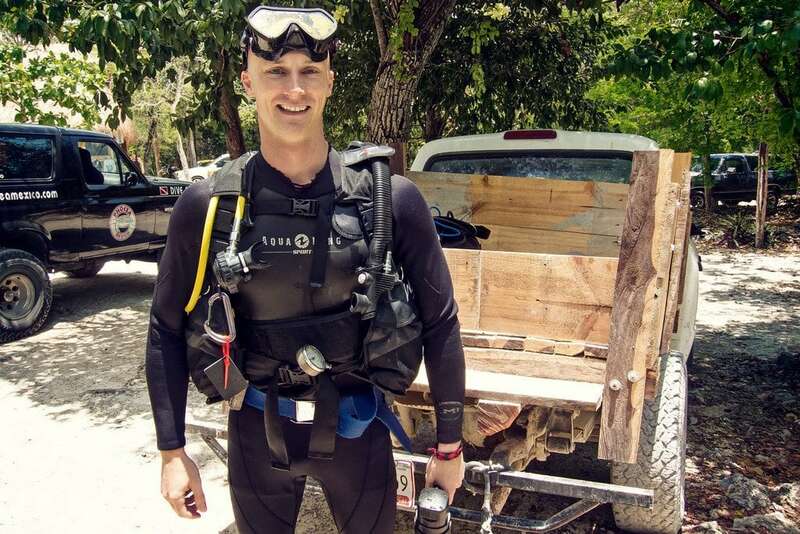 A cenote dive is a bit more expensive than an ocean dive, but you’re paying for quite a different (and challenging) experience. Great video. You mention that you shot it with an S95 in an underwater housing. Did you use any external lights with it? Not for the video. Just used our hand-held dive lights. The photo of me underwater was shot with a Canon G11 in an underwater housing, with a special waterproof external flash. Although I can see the appeal of this adventure, this is one I think I would skip. Snorkeling is about my limit for underwater adventure; however, I enjoyed the post, pictures, and video. Talk about a buoyancy test! What did you think of the rental gear? I just finished my open water last weekend. 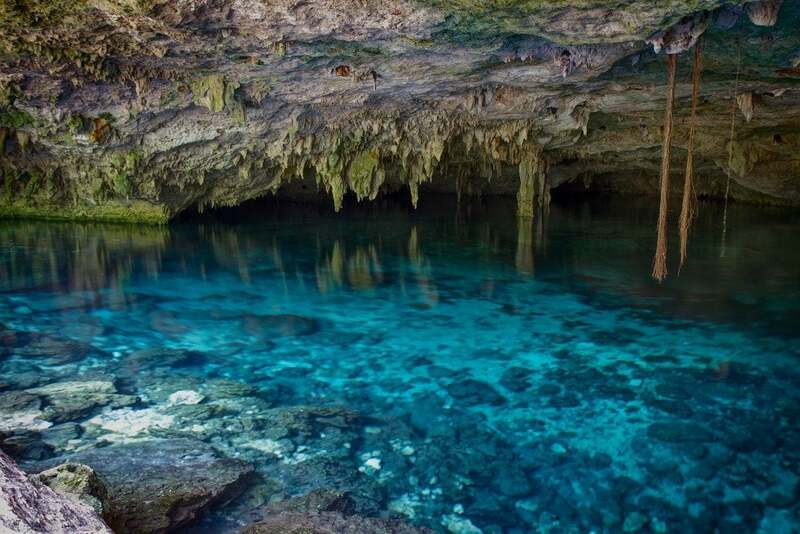 Hoping to check out some cenotes next summer but I’ve heard horror stories about renting gear. I just got my open water certification in La Paz and I’m so excited to start using it when I travel. I may have to head back East to check out the cenotes. Very cool Matt. Watching this in Ubud, Bali and getting psyched to hit the reefs in the Gillies in a couple days. Great video. Did you shot that with your GoPro? Cheers! I shot the diving portion with my Canon S95 & an underwater housing that Canon makes for it. The GoPro doesn’t do well in low light like this, plus it’s actually blurry underwater without a special flat-lens attachment. Absolutely spectacular, the colour of the water and the rock formations, what an adventure! Weightlessly floating around those stalactites & stalagmites was interesting. You have to pay attention to both what is below you, as well as above. I actually hit the cave ceiling at one point because I wasn’t paying attention. It’s like a maze. I’ve heard about the Cenotes and have wanted to dive them for years! The way the light shines through is just beautiful. I don’t think it would freak me out as I did the blue hole and was cool with that. Cost is about what I expected. Wow this looks absolutely spectacular…one of the cooler things I’ve seen in recent memory. I would love to try something like this – it’s good to know you don’t need to have that advanced certification anymore. That certainly makes it much more accessible to folks like me!